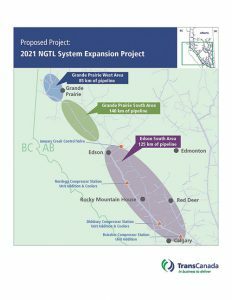 TransCanada Corp. announced that it will move forward with a proposed $140-million expansion of its NOVA Gas Transmission Ltd. (NGTL) System following the successful completion in March of an expansion capacity open season for incremental firm export delivery service at the Empress/McNeill Export Delivery Point. Shippers have executed binding agreements for 280 MMcf/d of incremental firm delivery service that will commence November 2021. The average term of the contracts awarded for the expansion capacity is 22 years. NGTL also concurrently executed incremental intra-basin firm delivery service contracts with other shippers for an aggregate volume of 75 MMcf/d that contribute to the need for the new facilities. This new investment is a component of NGTL’s $7.3-billion multi-year infrastructure expansion program that will increase transportation capacity for Western Canada producers and provide downstream markets increased access to clean-burning natural gas.